As Vauxhall looks to boost its somewhat drab image it's producing more niche cars like the Adam, Mokka and Cascada. While they're not going to set the world on fire, they do at least show that the brand is capable of designing something with a bit of an edge. But mainstream models, like the Insignia, remain its bread and butter. The company car favourite was a big step forward from the Vectra it replaced, particularly in terms of interior quality and refinement, but time has caught up with the Vauxhall so this facelift brings some crucial improvements. With the competition stronger than ever, it's key that the Insignia up its game. Not that the designers have gone overboard with any bold styling changes. In fact you'll be hard pressed to notice any differences from a quick glance, although it does get redesigned headlights and a wider grille. At the rear it's more noticeably different with the chrome boot strip sitting lower and splitting the redesigned rear light clusters. There are new alloy wheel designs too. Overall though the Insignia retains the same profile – it's a neat and tidy design. The big changes come inside. Vauxhall has addressed the criticisms of the cabin and there's now a much neater central console with fewer buttons. Not only does it look better – and is easier to operate – but quality has improved too. That goes for the whole interior, which feels better finished than before. The main switches and controls work with more precision and although there are a few bits of trim that could be better, the overall fit is impressive. The main infotainment screen has been improved and the system is much easier to use than before. Top models come with a touchscreen that also includes a clever Audi-style touchpad, which allows you to move the cursor on the screen using your finger on a small square touchpad by the gear lever. It recognises when you write letters and numbers for the sat nav and like a smartphone you can zoom into the map with a 'pinching' motion. It works really well once you're familiar with it, although it can be frustrating at times when a simple dial control would be more effective. Other interior improvements include a redesigned instrument cluster which now has a 4.2-inch colour screen in the middle with conventional dials either side. Top models come with an even bigger 8-inch screen which has a digital speedo and even a mini nav screen showing the actual map in colour rather than just an arrow. The changes to the Insignia aren't just skin deep though; Vauxhall has worked on the engine range as well as tweaking suspension and dampers to improve ride and handling. What really shines through is the Insignia's refinement – it rides very well and there's little road vibration through the cabin. It's also more aerodynamic than before and that shows at speed with minimal noise making the Insignia ideal for big stints on the motorway. In town a light clutch and positive gearchange mean it's easy to drive and the electronic power steering has been reprogrammed to give it a bit more weight and feel. As a result the Insignia is more than competent through corners. It's not going to set your world alight, but it feels safe and composed nonetheless. The engine range has been updated with improvements to the 2.0 CDTi diesel unit, which is now far quieter and more refined. It comes in three different versions – 120PS, 140PS and a top 163PS – and it's the engine most people choose. It's easy to see why as it suits the Insignia perfectly with a smooth power delivery and strong mid range pulling power, even the lowest powered model has 320Nm of torque. But what's even more impressive is economy and efficiency. Both the 120PS and 140PS versions emit just 99g/km of CO2, which means zero annual VED and a 14 per cent benefit-in-kind tax rate, while claimed fuel economy is a remarkable 76.3mpg. Yet the engine never feels slow or underpowered so even though it's badged ecoFlex you don't have to sacrifice any performance for this economy. There are also two new direct injection petrol engines – a 1.6 SIDI and the 2.0 SIDI – which provide a bit of excitement in the Insignia. The 1.6-litre engine produces an impressive 170PS and is genuinely enjoyable to drive while the 2.0-litre unit has 250PS and manages 0-62mph in just 7.5 seconds making it the quickest model in the range bar the VXR. The level of standard equipment has been improved with all models getting DAB digital radio, Bluetooth with music streaming, a leather steering wheel, cruise control and electric four-way lumber adjustment on the driver’s seat. Yet prices have actually dropped by a significant amount. The entry-level Design model, which replaces the Exclusiv, is £3505 less than before while the most popular SRi trim is a considerable £4195 cheaper. That makes the Insignia a lot of car for your money compared to the competition. 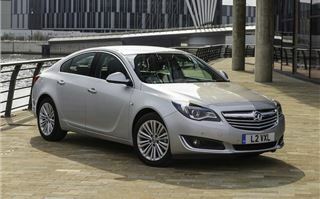 Vauxhall has succeeded in improving its already popular Insignia and addressing the shortcomings of the old model. The interior is now better looking and easier to use while refinement is exceptionally good and those two 99g/km 2.0 CDTi engines mean it's ahead of the competition and cheap to run. Factor in the big price drop plus high level of standard equipment and the Insignia has a lot going for it. Competitors like the Mazda6 and Volkswagen Passat may be better to drive or more stylish but as an overall package, the Insignia is hard to beat.